Brinkmanship - What Does It Mean? 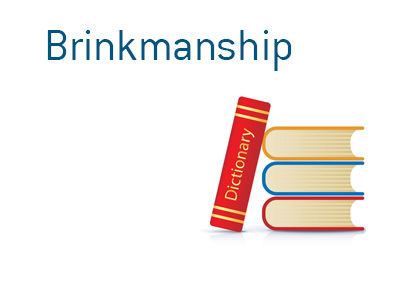 What does the term "brinkmanship" mean as it applies to the world of politics? What is the definition of the term "brinkmanship"? If you push something to the "brink", this means that you are pushing something to the absolute edge. In politics, "brinkmanship" refers to when an entity (usually a country) tries to push things to the "edge" in order to get something that it wants. For instance - North Korea has tried to get its way for years by threatening nuclear war on the entire planet. By doing so, North Korea hopes to enhance its position at the bargaining table by projecting an image of strength. The "image" is usually something quite different, however, as most of the other countries in the world see North Korea for what it actually is - an antagonistic country that has a large bark but not much bite. One of the clearest examples of "brinkmanship" came during the Cold War when Russia and the United States engaged in a dangerous game of escalating threats. Many people expected that a nuclear war would eventually break out, but this never took place.